The North Dallas Artist Studio Tour began in 2003 with a small group of artists who wanted to share their love of art by opening their home studios to their neighborhoods so others could see art in the process of creation and discover the wealth of art being created locally. 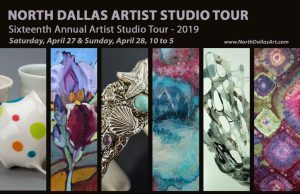 Focused on educating and inspiring others, the non-profit North Dallas Artist Studio Tour has since grown to showcase over two dozen artists annually. Participating artists vary from year to year; while new artists are invited each year, many artists participate regularly so that visitors can follow their creative journey over time. Visitors are invited to view working studios and talk to artists about their creative process; find out how they got started, what inspires them, and how their art is evolving. The tour features artists working in north Dallas, between Lovers Lane and LBJ Freeway, and from Denton Drive to Central Expressway. Download a map of this year’s participating studios on this website, and visit them to get inspired to create art yourself!